VANCOUVER — While the faces inside the locker room and management for the Buffalo Sabres have changed over the past decade, the same men have worked behind the scenes to sharpen skates and repair equipment. Dave Williams and George Babcock have seen the Sabres’ rise to the Eastern Conference elite and their lean years. As head equipment manager and assistant equipment manager, respectively, they are often the first to arrive at arenas — in Buffalo and on the road — and the last to leave. Sabres players will tell you they would be unable to perform without Williams and Babcock, whose tireless work behind the scenes helped them survive the franchise’s most tumultuous years. That longevity will be rewarded this coming weekend when they represent the Sabres and the Eastern Conference at the NHL All-Star Game in San Jose. The visiting equipment staff isn’t voted into the game. Instead, it is selected based on seniority by the Society of Professional Hockey Equipment Managers. The honor is rotated throughout the league. Longtime Sabres equipment manager Rip Simonick has worked the All-Star Game on three occasions. However, head equipment managers are now joined at the event by their assistants. While most of the Sabres enjoy a bye week, Williams and Babcock will fly to San Jose early Wednesday morning ahead of the players’ arrival. When All-Stars arrive Thursday — including the Sabres’ Jack Eichel and Jeff Skinner — the two visiting equipment managers are tasked with ensuring each player has the proper equipment for Friday’s All-Star Skills competition and the game, which will be held Saturday at 8 p.m. Eastern. Gloves and pant shells must match each player’s designated 3-on-3 jersey. Plus, each player has his own equipment preferences. Companies send gloves and pants to San Jose early, so All-Stars will not have time to break equipment in. Williams and Babcock will do whatever they can to make sure each player is comfortable on the ice when the event begins. It is not unlike their duties with the Sabres, though the Sharks’ equipment staff will handle the brunt of event preparations. The event is particularly special for both since the Sabres have two All-Stars. Williams joked he intended to give Eichel and Skinner prime real estate in the visitors’ dressing room. Every professional sport has an equipment staff, but they don’t operate under the pressures of those in hockey. Though Major League Baseball has a 162-game regular season and spring training, hockey is the most equipment-specific sport. For example, Babcock helped former Sabres goalie Martin Biron add more padding to a chest protector before the NHL started regulating the size of equipment. Babcock recalled that former Sabres forward Geoff Sanderson would use a different length stick for each period of a game. Baseball players are often more free-spirited and open to change, using multiple bats during a game for no reason other than feel and borrow a teammate’s glove without thinking much about the change. 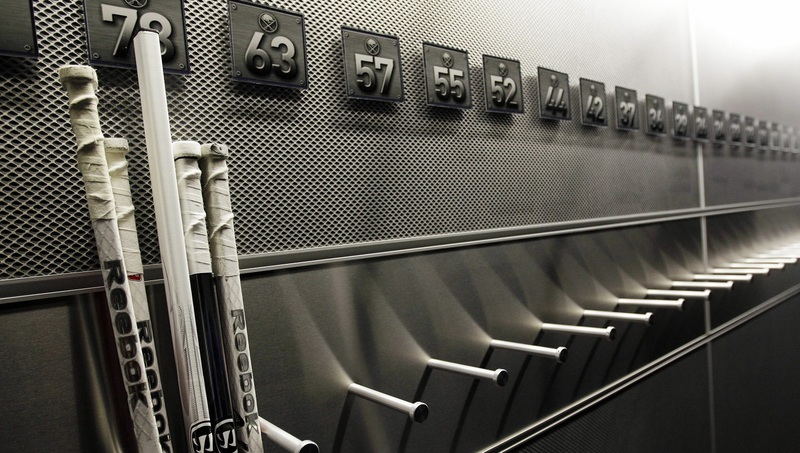 Like NHL players, equipment managers often take a long road to work at the sport’s highest level. Williams, a Rochester native, was a student equipment manager for Plattsburgh State’s hockey team before he worked as head equipment manager for the Knoxville Cherokees/Pee Dee Pride of the East Coast Hockey League. He then spent seven years as the head equipment manager for the Amerks before joining the Sabres. Babcock, a Williamsville native, worked at Sabreland, the team’s former practice facility in Wheatfield, before joining the team in a full-time capacity. Williams and Babcock will skip the little free time they have during the season to attend the All-Star Game. Their work and sacrifices are not overlooked by the players. Skinner has only worked alongside the two men since he was traded to the Sabres from Carolina in August, however, he was looking forward to seeing Williams and Babcock upon arriving in the SAP Center visitors’ locker room.